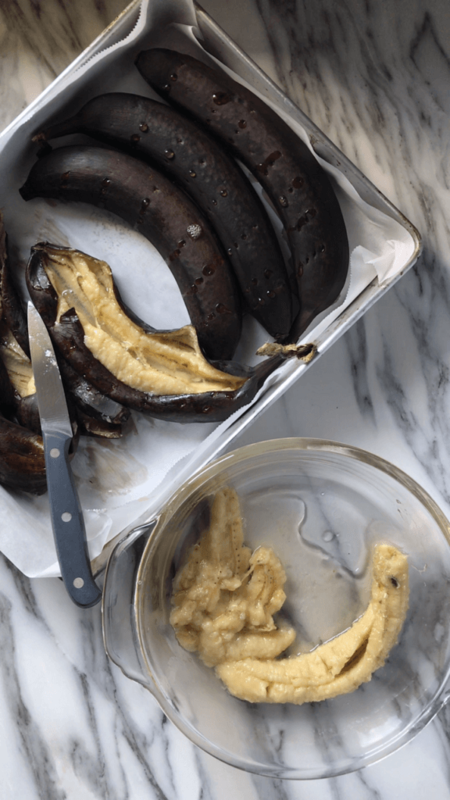 Home » How to » Roasted Bananas -Perfect for Baking! It is a well-known fact that roasting or grilling fruits and vegetables creates a totally different texture while intensifying the flavors in a spectacular way. In fact, roasting is one of the easiest ways to bring out the natural sweetness of fruits and vegetables. If you have visited here before, you know that I am a big fan of roasting/grilling fruits and vegetables. And don’t even get me started with the wonderful sweet transformation of Grilled Fennel, Roasted Red Pepper, or even Roasted Brussel Sprouts -who knew brussel sprouts could taste this good! So, when I first read about roasting bananas before using them to make Banana Muffins or banana bread… I did not need to be convinced. The truth is that I was already in the kitchen, looking to see if I had bananas with brown spots so that I could try this. In fact, any recipe that calls for overripe bananas can be replaced with roasted bananas. 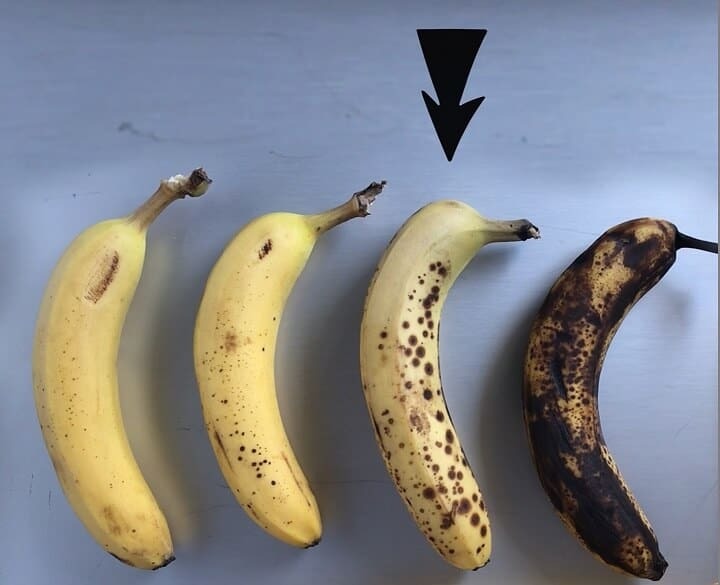 Ideally, overripe bananas should look like the third banana in the diagram above -the one that has an arrow pointing toward it. It’s very important to use spotted bananas in order to maximize the roasted banana flavor. So don’t bother using green or even yellow bananas because there will be no big taste transformation. The same goes for a banana that has seen better days, like our last banana in the picture above. Have you ever wondered why this is? Have you ever tasted an under ripe banana? If you have, you know that it will leave you with an astringent taste in your mouth. That’s because the starches found within the banana have not yet converted to sugar. As the banana ripens, that same starch will slowly begin to convert to sugar. The hormone responsible for this is called ethylene. That same hormone is also responsible for the color transformation of bananas -from yellow to spotted brown. But that’s not all. The texture also becomes creamier and softer. As far as the taste is concerned, the banana definitely becomes sweeter. Left on their own, say on the counter top, the sugars in the banana (in the form of starch) slowly convert. This usually takes a couple of days. There are ways that you can speed up this process. I’m sure you have all heard about placing apples and bananas together in a paper bag to speed up the ripening process. This works because the ethylene gas becomes trapped and immediately begins to convert the starch to sugar. If we were to heat up the bananas, not only would we be speeding up the whole ripening process, but caramelizing the sugars at the same time. The process of baking bananas in their skin begins by quickly rinsing them under running tap water. You are probably wondering why it would be necessary to rinse the exterior of bananas since we are going to be peeling the skin. Great question! The simple truth is that when you cut through any fruit or vegetable that has an inedible peel, like bananas, there’s always the risk that bacteria can be transferred to the fruit, found on the interior, as you’re cutting through the peel. So it is a good habit to get into… just simply rinse. 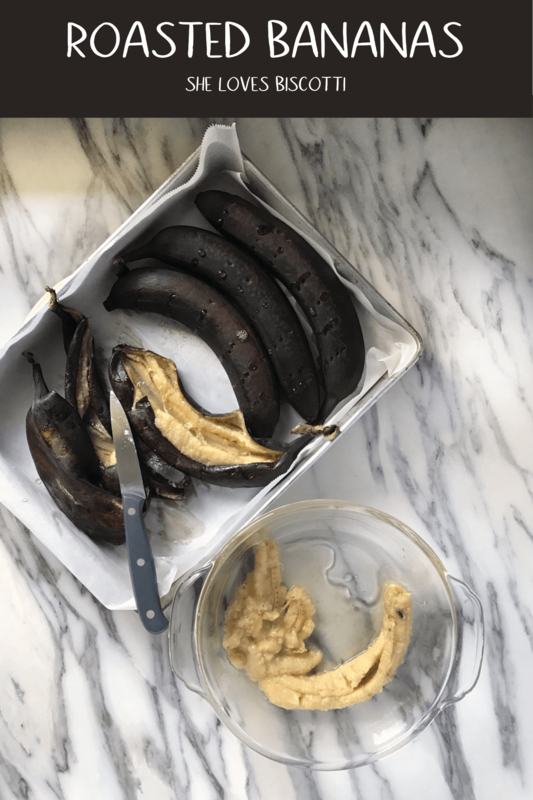 Once the bananas have been quickly dried with a tea towel, set them on a baking sheet that has been lined with either aluminum foil or parchment paper. 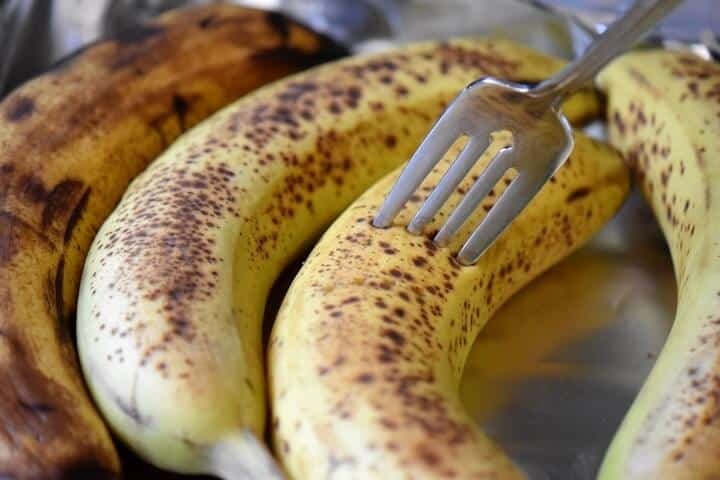 Poke a few holes with the tines of your fork and bake the bananas, in their peel. It should take about 15 to 30 minutes in an oven set at 300°F. 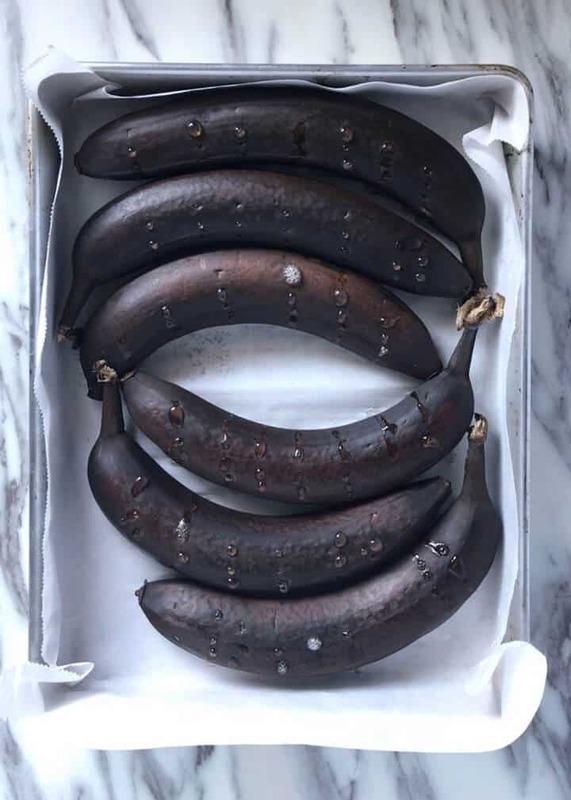 It’s a little bit difficult to predict the exact amount of time required for the bananas to be perfectly roasted due to variation in sizes and oven temperatures. So, you need to watch them. As soon as the bananas become totally black and shiny -they are done. Set them aside to cool off until you can handle them. Cut open the skin lengthwise and scoop out the banana. 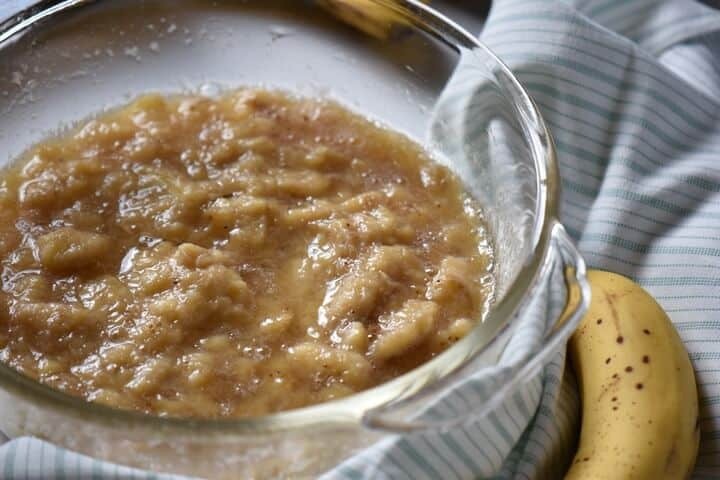 an amazing banana compote to pour over your pancakes or French toast. You can also freeze the roasted bananas in smaller portions and then just throw them in the blender when you are having that morning smoothie. No matter what you are making with these roasted bananas, you will immediately taste the difference. 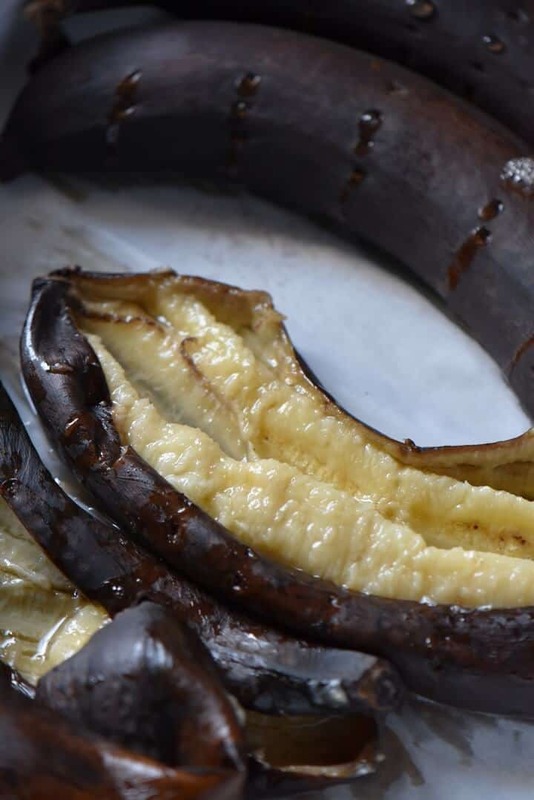 I picked up this little trick of using baked bananas (in their skin) to obtain the best banana recipes from a magazine called Cook’s Secrets (published in 2013). In fact, this is one of the best secrets to making the best banana bread. I‘m not really sure if this is actually still a secret, but just in case you did not know, I just wanted to share it with all of you. My new mantra is that roasted bananas should be used in any recipe for overripe bananas. Have you ever had a banana muffin made with bananas that have been roasted? What about a banana bread? If you did, you know what a difference it makes. 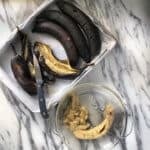 If you have never tried, I would encourage you to take 15 minutes and try roasting bananas the next time you are making banana bread, banana muffins, or even banana cookies as this is definitely a game changer. It was for me. 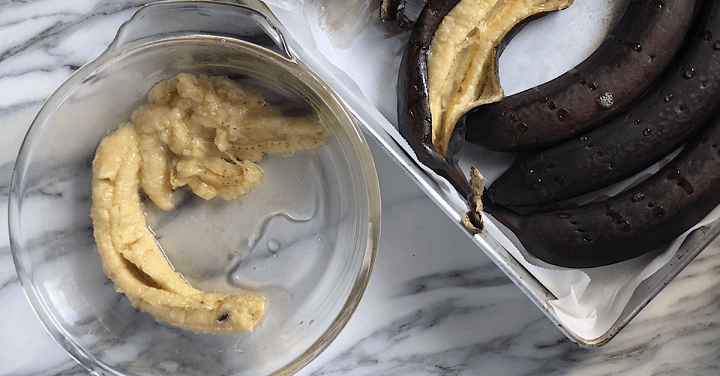 ★★★★★ If you have made this diy on Roasted Bananas, I would love to hear about it in the comments below and be sure to rate the recipe! Rinse and dry your bananas. Place the unpeeled bananas on the lined baking sheet. With the tines of a fork, poke a few holes in the banana skin. Bake the bananas for 15-30 minutes*. When the peel becomes shiny and black, remove them from the oven. When cool enough to handle, split open the skin in order to scoop out the roasted banana. The roasted bananas can be used immediately or frozen. *cooking time will vary based on the size of your bananas so make sure to check often. You can roast as many bananas as you want. IF YOU ENJOYED THIS ROASTED BANANAS POST, SAVE IT FOR LATER. PIN IT TO YOUR DIY BOARD! I have a great banana bread recipe but I can’t wait to try it with roasted bananas ! What a fantastic idea! Can’t wait to try when I make your banana muffins. Thanks Maria!